Sri Anagha Datta Society of Calgary is very excited to announce that for the very first time in Calgary, We are able to perform a procession of Lord Ganesha in downtown Calgary as a Ganesha Utsav Procession. We aim to make this an annual event. On Saturday, September 15th from 9:30am we will all meet at the Olympic Plaza (228 8th Ave SE), and walk along Stephen Avenue/8th Avenue SW to Shaw Millennium park (behind Mewata Armories). The procession will start at 10am. All devotees are requested to join in Dandia/Garba along the road. We would love to bring Ganapathy’s grace to Calgary! Please inform all your friends and families to join us on September 15th from 10am and seek the blessings of Ganesha. Ganapathy Puja and Offering of flowers by children. Dandia open to all devotees along the road – Everyone is welcome to rejoice. 12:00noon – Procession ends at Shaw Millennium park. 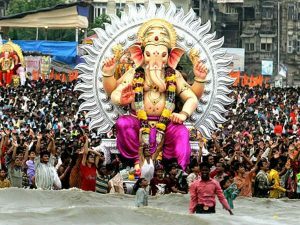 2:00pm – Ganesha Truck departs. Stay back at the park to socialize and rejoice.